What were you doing on this day last year? Facebook can remind you. What was the name of that pizza place? Google can remind you. What are you doing Sunday 6/5 at 5pm? 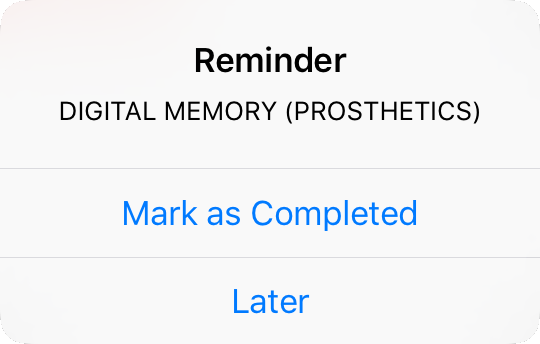 Mark it, so your device can remind you, DIGITAL MEMORY (PROSTHETICS): a conversation. Join us virtually via 360 livestream, while we talk about autobiographical memory and its relationship to digital media with Taeyoon Choi, Jade Davis, Nathan Jurgenson, Luka Lucic, Lorie Novak, and Chris Romero. *To have the full VR experience with your headset, download the youtube app and watch the live stream there. **You can also participate in the conversation through this google doc that we will be updating through out the event. Digital Memory Prosthetics: all video, selfies, instagrams, tweets, Facebook posts, digital calendars, map directions, all instances recorded on our phones, computers, tablets, by ourselves or by others, which become deeply instrumental to us in a way that extends and/or stands in for the functionality of the mind. Hosted by Artistic Research for Memory Prosthetics members neuroscientist Sonja Blum and VR maker/artist Sarah Rothberg, and REVERSE curator/artist Andrea Wolf. Taeyoon Choi is an artist, educator, and curator based in New York and Seoul. His art practice involves performance, electronics, drawings, and storytelling that often leads to intervention in public spaces. Recently, Taeyoon was an artist in residence at Eyebeam Art and Technology Center and Lower Manhattan Cultural Council. Taeyoon cofounded the School for poetic computation in 2013 where he continues to organize and teach, and he is currently working on a book of drawings about computation. Jade E. Davis is the Associate Director of Digital Learning Projects in the Center for Teaching and Learning at LaGuardia Community College CUNY. Her research looks at how digital media affects how society makes, understands, and accepts knowledge and culture. More specifically, she is interested in spaces that make digital information into knowledge and culture and the ethics and ownership of the data traces that are left behind. You can find some of her work on her website and can follow her on twitter @jadedid. Nathan Jurgenson is a sociologist and social media theorist. Nathan is co-founder and chair of the Theorizing the Web conference, a contributing editor of The New Inquiry, and a researcher at Snapchat. Luka Lucić is Assistant Professor in the Department of Social Science and Cultural Studies at Pratt Institute. Luka is a developmental psychologist whose research explores socio-cognitive development among young people who experienced abrupt changes of context as a consequence of migration, war, and urban destruction. His most recent publication titled Changing Landscapes, Changing Narratives (Pedagogy, Culture & Society) describes the effects of new media technologies on the psychological development of today’s young migrants. Lorie Novak is an artist and Professor of Photography and Imaging at New York University Tisch School of Arts and the founder and director of the department’s Future Imagemakers/Community Collaborations. Lorie uses various technologies of representation to explore issues of memory and transmission, identity and loss, presence and absence, shifting cultural meanings of photographs, and the relationship between the intimate and the public. Her Collected Visions project, 1996-present, exploring how family photographs shape our memory, was one of the earliest interactive storytelling websites. Chris Romero is a curator interested in media art, photography, animation, the Internet, and digital culture. In September 2015 he organized the first Internet Yami-Ichi in New York with Japanese Internet art collective IDPW. His exhibitions have been featured throughout New York and highlighted in The New York Times, The Huffington Post, and Hyperallergic. His academic and professional experiences express a passion for the curation, research, and preservation of media art.